BEDFORD — At 2 a.m. on a chilly May morning, Norman Franks sat slumped in a chair in a TV lounge at the Department of Veterans Affairs medical center, fighting for snatches of sleep under the glare of ceiling lights, he said. 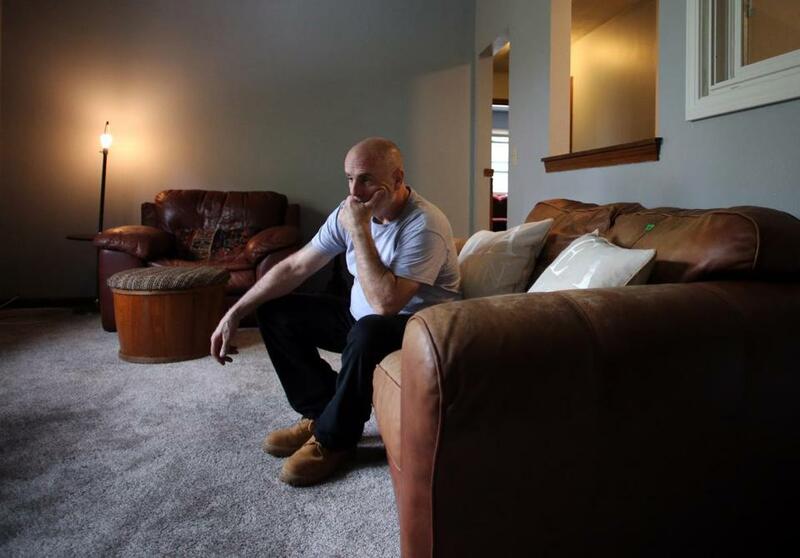 A Navy veteran of the late 1970s, Franks had led a troubled life. His addiction to crack cocaine led to a long series of armed robberies, which led to 15 years in prison. Now, he found himself homeless. They had to take him in, Franks thought. Instead, he spent the night in the woods, shivering under a tarp. 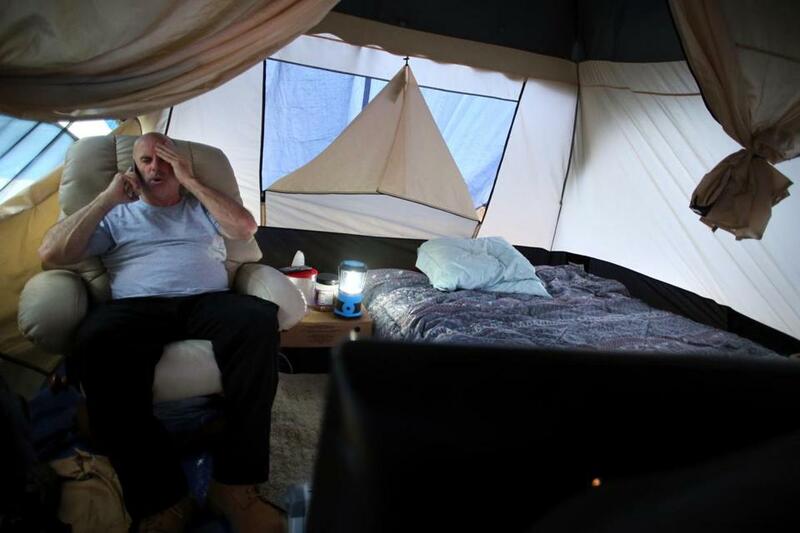 He stayed there for four of the next five nights, then spent the next four months in a cramped tent in a campsite on the grounds of Hanscom Air Force Base. As the weeks passed, Franks fell deeper into despair. But slowly, unexpectedly, he was reclaiming some of his life, thanks to a devoted group of strangers — members of an American Legion post, volunteers from a Catholic parish, even from a congressman’s staff — who felt obliged to aid a veteran in need. Franks, 58, is angry at how the VA handled his case, arguing that he never should have been turned away that May night when the temperature fell into the 40s, or to have lived at a campground for so long. When he arrived at the hospital that May evening, Franks said, he was told by a VA social worker that he might be able to sleep undisturbed in the TV lounge. But in the middle of the night, Franks said, he was awoken by a rap on the chair and ordered to leave. “I don’t have any place to go,” he mumbled. “I don’t give a [expletive]. You’re out,” the VA security officer answered, according to Franks. Wearing only a T-shirt and shorts, Franks stumbled into the night and dropped to the ground at the half-hidden edge of the VA property, resting against a tree and wrapped in the tarp he had taken from a small VA dump truck. VA officials said they have no record of an encounter that night between Franks and VA security officers. Under the Bedford VA’s policy, any veteran who turns up homeless can be sheltered in the urgent-care area if no other beds are available, agency officials said. Franks did contact the VA by phone three days later and discuss housing options, officials added. The next day, Franks declined an offer to be placed in a Haverhill facility affiliated with the VA, according to Ken Link, chief of social work services at the Bedford VA.
“Mr. Franks was offered multiple shelter options, but he did not care for the shelter options we were offering him,” Link said. Those options included transportation to the New England Center and Home for Veterans in Boston and other facilities closer to Bedford. But Franks said he declined because posttraumatic stress from his years in the Navy and prison have made living in close quarters nearly impossible. Franks in his Acton apartment. He hoped to be licensed soon to operate heavy equipment in Massachusetts. As it turned out, Franks was not on his own. Help came from the American Legion, where Franks’s first, desperate call in the following days was answered by Giorato, a Massachusetts Institute of Technology locksmith who tends bar at the post. “He explained he had no place to stay, and he asked if we could do anything,” Giorato said. “So, I spoke with everybody at the bar. People started taking $20 bills out of their wallets, and we probably raised $200” for a night’s stay in a hotel across the street. A few days later, Franks called again. The post also pitched in with blankets and other basic comforts. Franks said he soon was directed to the Hanscom campsite and helped by a local chapter of the St. Vincent de Paul Society, a Catholic organization that assists people in need. Its members took him shopping for camping equipment, bought him gift cards for groceries, and paid the $18 daily fee charged by FamCamp, the Air Force campsite, Franks said. Through it all, Franks said, he regularly called VA officials and caseworkers. In the summer, he was approved for placement at Bedford Green, a VA-linked development of 69 furnished apartments for older veterans who are homeless or at imminent risk of becoming so. But that approval was suspended after the VA determined Franks had behavioral issues that might affect other residents at the complex, Link said. “He was not ready, and there was concern it would not be conducive to the overall health of the environment,” according to the social work chief. Franks said he became increasingly distraught. Yet with cold weather only a few months away, Franks wondered anew where he would live. Help arrived once more, this time from the office of US Representative Seth Moulton of Salem, a Marine Corps veteran whose staff made calls on his behalf, Franks said. Finally, Franks found a federally subsidized apartment on his own in Acton, where he moved Sept. 26. The VA provided a tenant voucher for the new apartment, helped with the application, and referred him to movers. “We really do want to help homeless veterans, and we want homeless veterans to feel encouraged to come here,” Link said. When Franks moved to his new apartment, following a stop at a furniture bank that helps the poor and homeless, the two-bedroom unit felt like a palace. Giorato, the post auxiliary member who answered his plea, said she is thrilled. For his part, Franks said he hopes to be licensed soon to operate heavy equipment in Massachusetts. He has been trained for the job, he said, and wants to move ahead and leave his past behind. “I did my time. I’m not going back. I’m focused on going forward,” Franks said. He also does not want to be homeless again. 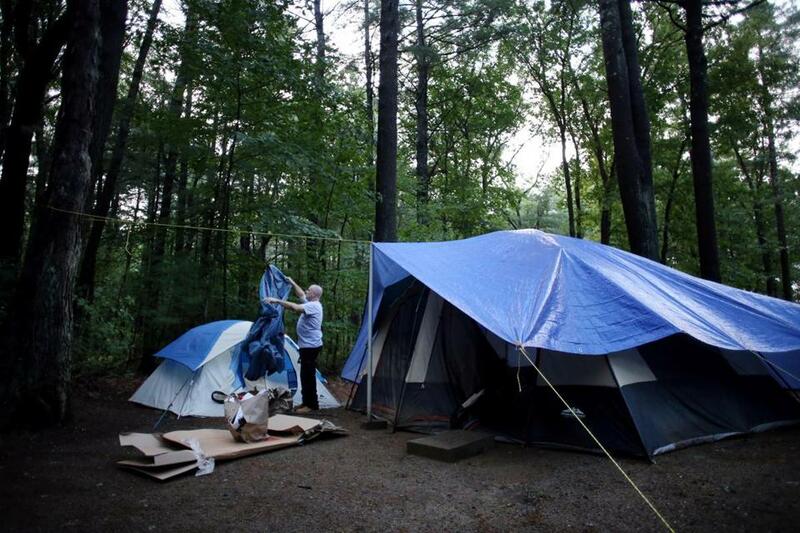 At the Hanscom campsite, Franks said he was helped by a local chapter of the St. Vincent de Paul Society.